Jimi generously extended center stage to Buddy Miles, providing a showcase for “Changes” and a charged rendition of the Howard Tate R&B hit “Stop”. “We had rehearsed “Changes” and a few others for Buddy,” explains Cox. “All of the songs we performed had been rehearsed. We didn’t look at it as Buddy’s part of the show. We were all there to give. 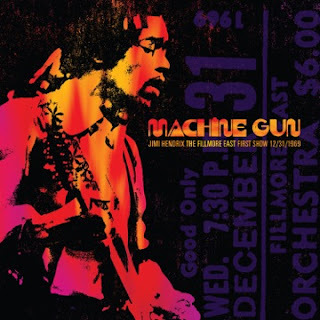 We were all there to help and material went on whether it was written by Jimi or not.” Former Rolling Stone senior editor David Fricke, who authored this collection’s liner notes, describes “Stop” as being something akin to “a psychedelic power-trio Temptations.” Hendrix’s scalding version of Elmore James’ “Bleeding Heart” is the set’s only other cover, underscoring the new band’s emphasis on the blues. Eagle Rock Entertainment is proud to announce a double release from Peter Gabriel on September 16, 2016. This features a reissue of the 2DVD set “Still Growing Up Live & Unwrapped”[MSRP $29.98] and for the first time a Blu-ray+DVD set of “Growing Up Live + Still Growing Up Live & Unwrapped” [MSRP $34.98] containing all the material from the original DVD releases plus the previously unreleased“Growing Up On Tour – A Family Portrait”. Growing Up Live will also be released on digital formats. The “Growing Up Live” concert film was recorded on the tour of the same name from 2002/3 and boasts key tracks Sledgehammer, In Your Eyes, Solsbury Hill, Digging In The Dirt, More Than This, Red Rain, Growing Up, Mercy Street, Here Comes The Flood and more. 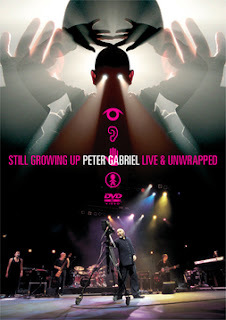 “Still Growing Up Live & Unwrapped” includes the concert film of the Still Growing Up tour from 2004 and the “Unwrapped” film (both shot in standard definition), which give a more intimate look at Peter Gabriel on tour and explore the world behind the songs featured in the shows. The Blu-ray+DVD set has all the material from these three DVD discs included on one Blu-ray disc and one DVD. Also included on the Blu-ray disc is the Family Portrait film. In 2002 and 2003, following the release of his album “Up”, Peter Gabriel went on the road with his “Growing Up” tour, once again collaborating with production designer Robert Lepage to create a spectacular and theatrical live experience. The tour took in thirty-two cities across the USA, Canada and Europe with this concert film, directed by Hamish Hamilton, being shot over two nights at the FilaForum in Milan in May 2003 with Peter Gabriel and the band performing “in the round” at the center of the arena. Filmed in high definition, this was originally released on DVD in 2003 but never on Blu-ray. The DVD is now being reissued and the concert is being released on Blu-ray for the first time. 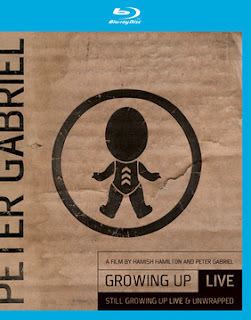 “Still Growing Up Live & Unwrapped” is taken from the “Still Growing Up” tour of 2004, which took Peter Gabriel and his band into smaller and more intimate venues in contrast to the large arenas chronicled in the “Growing Up Live” film. Award-winning director Hamish Hamilton reunites with Peter Gabriel for this concert film. The ‘Unwrapped’ film sees Anna Gabriel take over the director’s chair with the collaboration of Hamish Hamilton. A simpler approach suggested a different set list and Peter, Hamish and Anna were determined that this should be filmed in a very different style. It shows Peter Gabriel as many of his fans love to see him, just playing the music. For the Blu-ray+DVD edition “Growing Up Live” is presented in high definition for the first time on the Blu-ray disc. Also on the Blu-ray disc in standard definition are the “Unwrapped” film and its bonus features and, as an added bonus, Anna Gabriel’s previously unreleased film “Growing Up On Tour – A Family Portrait” has also been included. The DVD in this set contains the “Still Growing Up Live” film and its bonus features. “Growing Up Live” + “Still Growing Up Live & Unwrapped” are important films that capture one of our most innovative and best loved artists at his very best. After topping the rock charts in 2014 and 2015, The Pretty Reckless returns with their extraordinary third studio album Who You Selling For, due October 21st on Razor & Tie. The new album is the band's anticipated follow up to Going To Hell, which spawned the biggest rock song of 2014 in "Heaven Knows" and a total of three #1 Mainstream and Active Rock hits. The first single from the new album, "Take Me Down," premiered worldwide July 15th on iHeart Radio and impacted at rock radio four days later on July 19th, quickly climbing to #7 on the chart. Listen to the new single HERE. Produced by longtime collaborator Kato Khandwala, Who You Selling For is an arresting collection of rock tunes that expand the band's sound to encompass soulful, bluesy undertones, written by front woman Taylor Momsen and guitarist Ben Phillips. This raucous 12-track collection puts Momsen's dark lyrics and raw, charismatic vocals on full display while the band delivers at full intensity with a level of musicianship that raises the bar. Formed in 2009, The Pretty Reckless released their debut album Light Me Up in 2010 scoring legions of fans worldwide, but it was their sophomore record Going to Hell that positioned the band to become the first new artist to breakout of rock in years, debuting in the Top 5 on Billboard's Top 200. Achieving three #1 Rock hits - "Heaven Knows," "Fucked Up World" and "Follow Me Down" - was a feat that has not been accomplished by a female fronted group since The Pretenders in 1984, nearly a quarter of a century ago. Despite feeling the physical and emotional demands from their epic two-year run supporting Going to Hell, Momsen and Phillips jumped right into writing the songs for the new album. "We had so much we wanted to say, it was like shaking a can of soda on tour, and then when we started writing we cracked the seal," says Momsen. "The touring life is very isolating. You look at the world through a bus or airplane window. But music is the healing factor. It's the one thing that is grounding and a true companion through the forest. It saved us - again." With Who You Selling For the band continues to take bold steps forward, cementing their place at the forefront of rock. The deeply personal album features a diverse set of standout tracks, from the blistering hard rock of "Oh My God" to the classic southern rock of "Back to the River". Lead single"Take Me Down" features Taylor's distinctively smoky voice rolling over '60s - tinged rock guitar.Loudwire says, "'Take Me Down' features a bit of rasp and a soulful delivery from Momsen, while guitarist Ben Phillips gets a solid mid-song riffing showcase that raises the track to a new level. Add in some backing organ playing and you've got a blistering new song from the band." The band will hit the road this fall in support of the album and will run through major US cities such as Chicago, New York and Nashville before wrapping on December 6th in Los Angeles. Tickets go on sale to the public Friday August 12th at 10 AM local time. Please visit The Pretty Reckless for complete info. October 27 Dallas, TX Gas Monkey Live!